Katelyn was born 5 weeks premature. She has Apraxia of Speech and she has Autism (specifically Asperger’s). As an infant and toddler Katelyn struggled to swallow and to speak. She had daily speech and weekly occupational therapy to help with those issues. Through it all Katelyn was sweet and sunny and in her own little world. Katelyn did well in school until about 4th grade. She could not handle the teasing of other kids and the stress of being called on in class. She could not speak under pressure. She could not answer out loud if asked a question. She cannot sequence steps and has poor motor planning skills. She retreated into herself and became withdrawn and difficult. We decided to homeschool her starting in 5th grade. Homeschool had its challenges but she did well and successfully completed her education. She scored very high on the HiSET exam, which is Missouri’s equivalent of a GED. She is an avid reader and very intelligent. Katelyn does not like to go anywhere or interact with anyone. Katelyn will not learn to drive. We tried so many programs and therapies, including equine therapy and medications. We began fostering puppies for PAWS 4 Autism in 2016. Katelyn loves animals. She was required to take them on outings weekly. Katelyn responded to the program. She loved answering questions about the pups and showing them off. It was easy for her to focus on the animal and so her social anxiety did not interfere. She was so proud of each pup and they mastered a new social skill in public. Kozmo has been with us for 7 months. Kozmo knew immediately who his girl was. He climbed in our SUV (full of people) and sat right behind her with his head on her shoulder. With Kozmo, she is able to go on outings like church group and she has even attended a church concert. She states that he calms her, keeps her from panicking. She can focus on him and stay grounded. If she has a meltdown he is there to comfort and cuddle her until she is over it. Kozmo makes her laugh with his goofy antics. She has a beautiful laugh and smile that rarely comes out. She has learned how to care for him and how to pack all he might need on an outing. She has learned how to anticipate his needs like water when we are out or protecting him from glass on the parking lot or ground. Without a service dog, Katelyn’s social anxiety would not allow her to leave the house. Last week Katelyn and Kozmo went into the grocery store, just the 2 of them for something we needed. I waited in the car and it was a great accomplishment for Katelyn. She has gone on shopping trips and out to dinner with our family multiple times since having a service dog. Katelyn’s counselor says her mental age is about 14/15. We are continuing online classes with her. Her future can include college, trade school or anything like it since Kozmo will be able to attend with her. 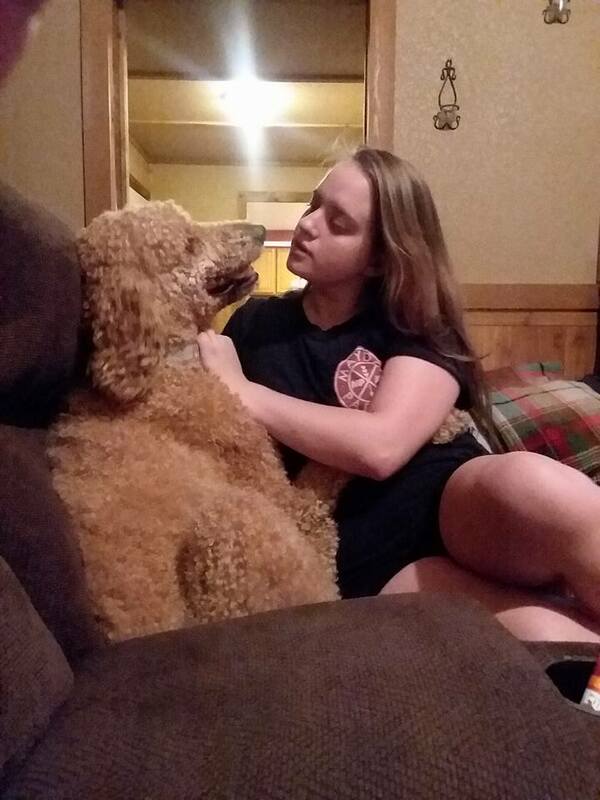 Katelyn still has Autism and all its issues, but a service dog definitely makes her daily life easier. Her service dog makes a future career and independence for her a goal that we did not think she could obtain. Katelyn has many talents and I cannot wait to see what direction she goes in, and all of it possible because of a super special service dog from the amazing volunteers at PAWS 4 Autism.